Not Guilty And Other Defenses | South Carolina Personal Injury Attorneys | Criminal Defense Lawyers - Strom Law Firm, L.L.C. These are a number of common defenses to Federal Crimes. The best possible defense can only be determined after careful analysis of the facts of your case. Insanity is an affirmative defense in Federal Court to any federal statute. Basically what an insanity defense states is that, at the time of the commission of the crime, the defendant, because of a severe mental disease or defect, was unable to understand the wrongfulness of his acts. Just having a mental disease or defect does not necessarily give rise to an insanity defense. The burden of proof is on the defendant to establish by clear and convincing evidence the elements of the insanity defense. Also, with an insanity defense, the defendant must give notice to the government as part of the pre-trial motion stage of the case. Expert testimony on the issue of insanity is almost always required and should be presented in an appropriate insanity defense case. Once the government is on notice that the defendant is raising the insanity defense, the government may ask the Court to allow it and to examine the defendant for mental disease or defect. The Court, the government, or the attorney for the defendant may request an examination of the defendant to determine his or her ability or competency to stand trial. Mental capacity to stand trial is different from an insanity defense and it deals more with the defendant’s ability to actively participate in the preparation, trial, and decision making process of his or her trial. The theory of a defense of necessity is that the defendant’s free will was properly exercised to achieve a greater good or avoid a greater harm. The elements of the defense of necessity are (1) that the defendant was faced with a choice of two evils and he chose the lesser; (2) that the defendant acted to prevent imminent harm; (3) that the defendant reasonably anticipated a causal relation between his conduct and the harm to be avoided; and (4) there were no legal alternatives to violating the law. Under the theory of this defense, an individual may be excused from wrongdoing if he acted on advice from his attorney. Courts will require that defendants show (1) the defendant sought the advice of an attorney before taking the action in question; (2) the defendant sought the advice of an attorney in good faith, an attorney whom he considered to be competent; (3) for the purpose of receiving advice on the legality of his future conduct; (4) made a full and accurate report to the attorney of all of the facts; (5) acted strictly in accordance with the advice the attorney gave. The defense of duress or coercion has generally excused otherwise illegal conduct. Under the defense of duress the defendant would not be held criminally liable if he acted under a well-grounded fear or immediate death or serious bodily injury and had no other choice than to violate the law. To prove a defense of duress a defendant must show (1) an immediate threat of death or serious bodily injury; (2) a well-founded fear that the threat will be carried out; and (3) the absence of any reasonable opportunity to escape the threatened harm. The defendant, as with other defenses, must introduce sufficient evidence on all of the elements before the court will instruct the jury on the defense of duress. Issues that arise in the duress defense are immediacy and opportunity to escape the threatened harm. Immediacy means that the threat must be impending. It can not be a veiled threat of future unspecified harm; it must be a present and immediate threat. As to the ability to escape the harm, the defendant must show that there was no reasonable ability to escape the harm. An issue that often arises with this part of the defense is defendants recklessly placing themselves in dangerous situations. 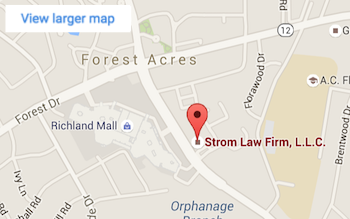 The criminal defense lawyers at the Strom Law Firm, LLC provide an aggressive, well planned defense and will fight to have your charges reduced or even dismissed. Contact us today for a free consultation to discuss the facts of your situation and hear how we can help. We offer flexible payment options and accept Visa and Mastercard.